Form held again in the third round of the boys 18s singles, with the top 14 seeds advancing Monday, the fourth consecutive day of perfect weather in Southwest Michigan. Although top seed Michael Mmoh, No. 2 seed John McNally and No. 3 seed JJ Wolf lost only six games total in their third round wins, No. 4 seed Sam Riffice was pushed to three sets before taking out Paul Barretto 6-3, 0-6, 6-1. Riffice, who lost his first match in Kalamazoo last year as the ninth seed but went on to finish sixth, was able to get some advice from his mother Lori during the 10-minute break between the second and third sets. Although she is in Atlanta for the girls 12s as a USTA National coach, she was still able to provide the tips he needed in a 7-minute phone call. Riffice, who has competed on the ITF Junior Circuit the past 12 months and is 43 in the world rankings, said he enjoyed playing on Acker Court, the middle of the three show courts at Stowe Stadium. Next up for Riffice will be No. 20 seed Sebastian Korda, who defeated Chase Bernstein 6-0, 6-4. Korda and Riffice train together often in Florida, and have been practicing together for this event the past two weeks. Korda, who won the Clay Courts last month, succeeding Riffice, who won that title in 2015, said he is eager to prove himself against Riffice. Riffice knows he will have his hands full against Korda. 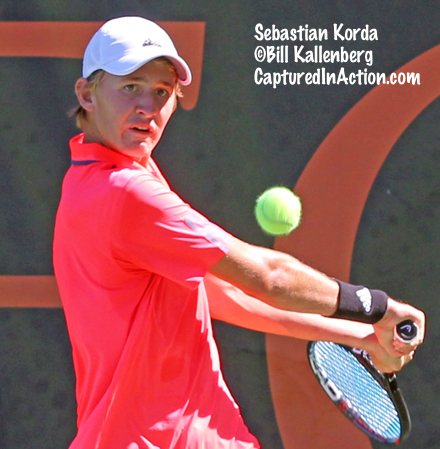 In addition to his Clay Court title, which he won unseeded, Korda picked up his first ATP point this summer in Buffalo, which gave him added confidence coming into Kalamazoo. His father doesn’t usually travel with him to tournaments, but the 1998 Australian Open champion is here in Kalamazoo. Another interesting fourth round match Tuesday will feature the past two 16s champions, when McNally takes on 2015 champion Patrick Kypson, the No. 30 seed. Kypson defeated unseeded Nick Stachowiak 6-0, 6-2, the second consecutive match he’s won by that score. McNally advanced with a 6-3, 6-1 win over David Horneffer. The only top 16 seed to fall in the 18s, and the only 18s seed to lose on Monday, was No. 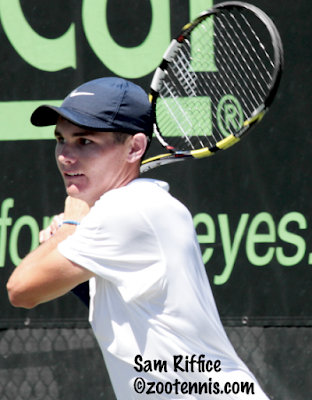 15 seed William Genesen, who was beaten by Jason Legall 6-3, 6-3 Monday evening. No. 27 seed John Speicher came close to bowing out, saving two match points in the second set, but he came back to beat Aleks Huryn 2-6, 7-6(2), 7-5 in a three-hour match that finished at 8:45 p.m. The 16s division lost its first top 4 seed Monday, with Ian Sturgill of Virginia defeating No. 4 seed Kevin Zhu 6-2, 4-6, 6-2, but that was one of only two seeds to lose in the third round. The other was No. 23 seed Nathan Han, who fell to Matthew Tsolakyan of California 6-4, 6-1. Top 16s seed Lukas Greif defeated Jacob Bullard 6-1, 6-2 and No. 2 seed Christian Alshon downed Jake Fishkin 6-2, 6-3. No. 3 seed Jared Pratt also moved on in straight sets, beating Luke Vandecasteele 6-2, 6-3. The third round of 16s doubles was held Monday at the Western Michigan University Courts. After top seeds Brandon Nakishima and Jake Sands lost on Sunday, No. 3 seeds Alshon and Zhu were beaten today by Brant Fenno and Andres Martin 6-7(5), 6-3, 13-11. Both 16s and 18s division will play fourth round matches in singles and doubles on Tuesday. For complete results, see ustaboys.com. Scores are updated throughout the day on the draws, which are under the Players tab. Live streaming is also available on the front three courts.